The Hades framework includes a large library of simulation models for digital systems. 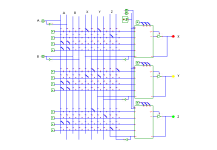 All gate-level simulation models are based on the industry-standard VHDL std_logic_1164 multilevel logic system. 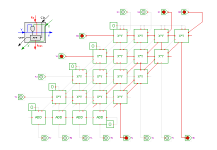 While std_logic_1164 is slightly more complex than the simple 01X- or 01XZ-logic models, the option to model bus systems with floating ('Z') and weak ('H') values is a clear advantage. The use of std_logic_1164 also means that students will already be trained in a multilevel logic model from the beginnning. 'glow-mode' animation with colors based on the current logic value of a signal. special 'glow-mode' colors for undefined ('U', 'X') or tri-stated ('Z') buses. context-tooltips provide additional information about signals and components (e.g. clock-generator period, gate-delays, number of events). 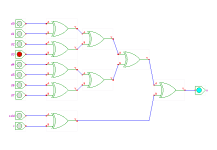 'real-time' simulation mode slows down the simulator to visualize circuit timing (e.g. propagation delays). component property-sheets allow you to set component properties while the simulation is running (e.g. timing parameters). 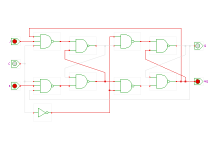 all basic gates with up to four inputs (buffer, inverter, AND, OR, NAND, NOR, XOR). complex gates (AOI and OAI). all standard latches and flipflops. a variety of interactive switches and displays. variants of all the above with DIN-style (German) symbols. TTL-series combinational components (e.g. 7400/7449/74154). TTL-series registers and counters (e.g. 7447/74390/74590). registers and memories (RAM, ROM, e.g. 74219, 6116). text-mode and graphics LC displays. subdesigns (can be nested to arbitrary depth). counters and detectors (e.g. hazard-detectors).